Comment: This item shows wear including ex-library markings. On the surface, To This Day, is a comic tale of a young writer stranded in Berlin, but on a deeper level, it is a profound commentary on exile, Zionism, divine providence, and human egoism. Published in 1952 and now translated into English for the first time, Agnons final novel presents an eccentric tour through First World War Berlin. The narrator, a Galician-born Jew from Palestine, is stranded in Germany, passing his days in search of a place to spend the night amid a severe housing shortage. As he moves through a series of apartments, convinced that there is "a grand conspiracy of rooms" against him, the narrative introduces, drops, and periodically reëncounters characters, among them a famous stage actress running a hospital for invalid soldiers; a young man under her care, too traumatized to speak; and a landlady who fills the bathtub with vegetables and dirty linen. All have stories of their own, leading the novel away from any central thread. 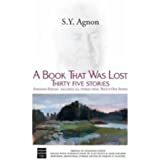 Still, Agnons young exile, whose thoughts "jumbled everything while forgetting nothing," gives voice to an idiosyncratic allegory of spiritual homelessness. Gently used but felt loved! 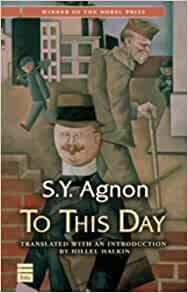 Agnon published six novels in addition to many short stories. “To This Day” is the shortest of his novels, comprising just 158 pages in this beautiful English translation by Hillel Halkin of Agnon’s original Hebrew. The story is, on a literal level, a humorous tale of a young man with scholarly and literary ambitions who goes from Palestine to Berlin with the hope to be able to buy the large library of a deceased scholar. It is the time of World War I. He is trapped in Germany and is unable to return home. He encounters many problems, which are hilarious to the reader. There is a shortage of housing. He wanders from one rented room to another. Each room has a flaw which compels him to try to find a better one. While the novel can and should be read as a humorous tale, it should also be mined for its deeper meaning, which is explained in an informative fifteen-page Introduction, which if read gives not only deeper insights, but also increases the delight in reading the tale. Underlying motives include commentary on exile both today and in ancient Israel, the good and the bad about Zionism, Orthodoxy in religion, divine providence, human egoism and fallibility. Agnon is an elegant storyteller. He is the narrator who brings the reader into WWI Germany. You can read second hand histories all day, but you will never learn as much as you will reading this account from a literary genius who was there. Yes it is fiction, but you can tell that it all really happened. This small book has turned me into an avid fan of S. Y. Agnon. I have ordered another of his books, and if it should appeal to me as much as To This Day I will surely order the rest of his oeuvre.